There are currently five Alzheimer’s drugs approved by the U.S. Food and Drug Administration that temporarily help with memory and thinking problems, but none that treat the underlying cause of the disease or slow its progression. In healthy brains, the cells that make up blood vessels fit together so tightly they form a barrier that keeps stray cells, pathogens, metals and other unhealthy substances from reaching brain tissue. Scientists call this the blood-brain barrier. 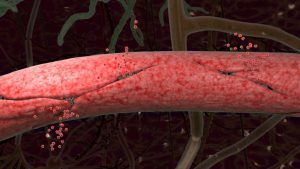 In some ageing brains, the seams between cells loosen, and the blood vessels become permeable. Participants in the study had their memory and thinking ability assessed through a series of tasks and tests, resulting in measures of cognitive function and a “clinical dementia rating score.” Individuals diagnosed with disorders that might account for cognitive impairment were excluded. The researchers used neuro-imaging and cerebral spinal fluid analysis to measure the permeability, or leakiness, of capillaries serving the brain’s hippocampus, and found a strong correlation between impairment and leakage.